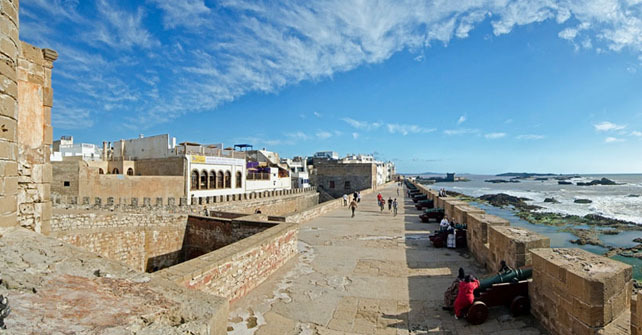 The relaxing and seaside town of Essaouira is soaked in century old Medina culture and history. It is the most charming port city on the Atlantic coastline with strong & forceful sea winds blowing throughout the year, attracting foreign tourists equally with its extensive beaches, refreshing atmospheric condition and an intricate medina which is now a UNESCO recognized World Heritage Site. Essaouria features majestic ramparts from 18th-century protecting its winding streets and pastoral whitepainted houses and blue painted fishing boats standing at seashore. There are plenty of opportunities for Essaouira day trip, as one can have ample opportunities to explore its rustic surroundings including scenic villages and forest tracks. On a full day Morocco tour to Essaouira, you can taste the special seafoods of local area, or spend time in swimming and kite surfing on the beach shore. 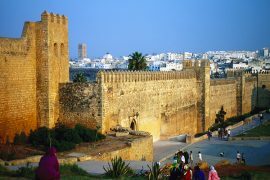 Our Morocco tour operators can well plan your Essaouira day trip, one of the must-see destinations for Morocco tourists. The coastal town of Essaouria echoes a serene feel and offers the best fun of kite surfing besides the sea water. It draws huge crowds from all over the world due to its friendly weather, lovely sea sights and beautiful medina architecture. 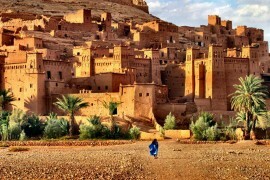 Luckily, you have the option to know its culture, history and heritage on a day trip to Essaouira that begins from the bustling city of Marrakech with pick up in a private vehicle. We are going to travel around 200Km in 3hrs time. In this day long guided trip, you can have an exclusive view of local art, woodwork, the Portuguese port, the beautiful sqalas and the souks. After you go through Chichawa and enter into the Essaouira city, the amazing looking 15th-century deck from Portuguese era constructed at the base of its ramparts will be visible. 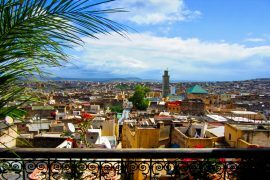 Then you will be taken to the old town medina to have a look at the spectacular mosque in the city at Moulay El-Hassan Square, enjoy a walk along Siaghine Alley, and have a brief stopover at the patio of the north citadel to see the excellent marquetry where the best of Morocco’s artisans products are put on display for sell. A day trip to Essaouira allows you to visit the sqalas which bring the marvelous view of oversize canyons in rows facing out to the blue Atlantic Ocean and also have a tour to the nearby municipal market. As you go past Sqalas and move in the direction of Derb Laalouj Street, you can come across the Sidi Mohammed Ben Abdallah museum. Here, you can find old melodic instruments, local songs, Berberic documents, carpets, costumes, weapons, and more. Going towards the northern section of the city, you can visit the Mellah, the walled Jewish quarter of Essaouira, line by a colorful market which goes up to Bab Doukkala. After spending a few more leisure moments in the beachside restaurants and resorts, you will go back to Marrakech where your day trip to Essaouira will come to an end. Explore the culture, history, community and lifestyle of the fishing town with a walk along the local streets and beaches. PureMorocco Tours and Travels offers the most refreshing and enjoyable day trip to Essaouira covering some of the popular city attractions. We have knowledgeable local guides to help you accomplish your Essaouira trip without any delay and hassle. From Marrakech hotel pick up to hotel drop off, you will have access to everything that will make your transfer comfortable and exploration of the artisan port city of Essaouira in Morocco memorable. To take a tour to Essaouira at your own pace and capture the breathtaking heritage sites and enjoy fun activities, enquire about Essaouira day trip at PureMorocco Tours and Travels by giving us a call on +212537699090.